“Obraz” was registered on June 13, 2000 as an annual newsletter, which is a periodical scientific publication in the field of journalism and literature. 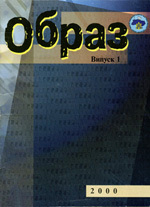 The publisher is Taras Shevchenko National University of Kyiv. The Chief Editor is PhD in Philology Tamara Starchenko (at that time – the Department Head of History of Literature and Journalism of Institute of Journalism of Taras Shevchenko National University of Kyiv). The Head Editor is Doctor of Philology Volodymyr Rizun (the Director of Institute of Journalism of Taras Shevchenko National University of Kyiv). The first headings were the following: “Light of Christianity”, “Theory of Image”, “Diverse World of Literature”, “Op-ed Horizons”. The publication form was exclusively textual, without photographs and figures. 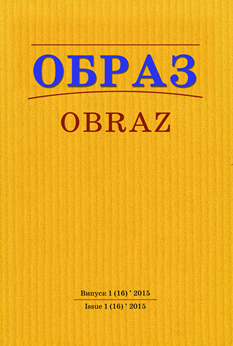 Thirteen editions of “Obraz” during 2000-2013 encompassed the following thematic scope: church publications, church and media, polemical literature, Christian ethics, text theory, journalistic image, op-ed genres, op-ed discourse, op-ed columnists’ figures, editorial activity, creative groups, periodicals review, regional periodicals, sports magazines, gender issues, advertising periodicals, styles of past cultures, literary debates, history of Ukrainian television, journalism history, etc. During 2000-2013 the papers of more than 60 authors were published, 23 of them were doctors of sciences. The majority of authors are associate professors and graduate students. The scientific papers were submitted from more than 15 cities of Ukraine: Kyiv – 27, Vinnitsia and Zaporizhzhia – 4, Lutsk, Poltava and Lviv – 3, and also from Donetsk, Kamianets-Podilsky, Odesa, Simferopol, Sumy, Ternopil, Kharkiv, Chernivtsi and others. According to cooperation agreement between Taras Shevchenko National University of Kyiv and Sumy State University, December 8, 2014, “Obraz” was re-registered (Certificate of state registration of printed mass media: Series КВ No. 21240¬11040ПР). It has become a scientific journal issued 6 times per year since that time. The thematic scope covers all aspects of journalism and social communications. The journal is added to List of scientific specialized editions of Ministry of Education and Science of Ukraine, approved by Order No. 747 dated 13.07.2015. It publishes the main results of thesis on social communications. The Publisher is Sumy State University. The electronic version of the journal has been sent to Vernadskyi National Library of Ukraine for depositary storage and the portal of Ukrainian scientific periodicals since 2010.